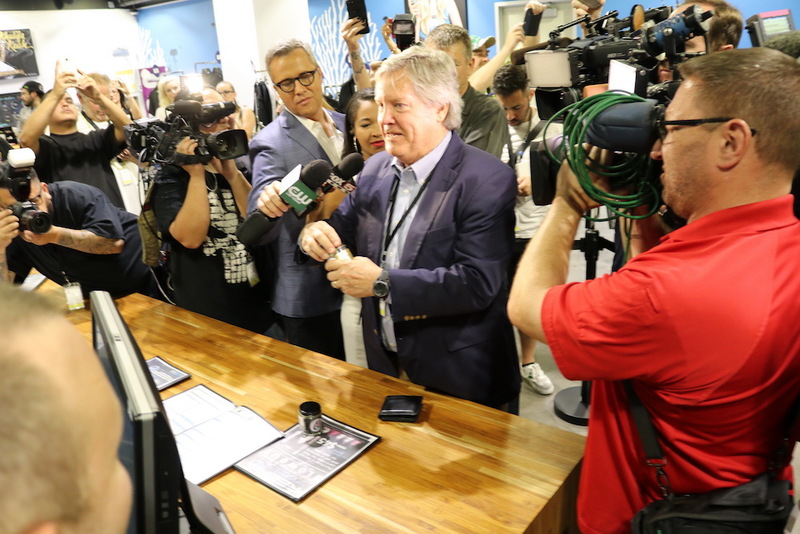 When the clock stuck midnight on July 1st, 2017, Nevada state senator Tick Segerblom (D) was surrounded by a flurry of cameras as he made the state’s first purchase of legal cannabis at Reef Dispensary’s Las Vegas Strip location. Instrumental in rolling out the state’s legal cannabis programs, Segerblom has become such a local hero to the movement that he has even had a cannabis strain named after him (Segerblom Haze). The rollout of the program has been an incredible success for the state of Nevada, but not without a few kinks that still could be improved upon. This election cycle, Tick Segerblom is running for Clark County Commissioner and if elected, he will tackle some of these issues that still face the industry. We spoke with Tick about his position on many of these topics. Mike Pizzo: You’ve been a supporter of Nevada’s cannabis program since the beginning. Are you happy with what we’ve seen during the first year of the recreational program? Tick Segerblom: I would say ecstatic is an understatement (laughs). It’s really been amazing how we took off with a bang on July 1st and we haven’t stopped. You’ve also been a supporter of the idea of consumption lounges in Las Vegas. Is this something that you think is a realistic possibility? I have to believe so. Everyone agrees that it’s total hypocrisy to encourage everyone to come and buy marijuana and then say “by the way, there’s nowhere to use it.” I also think it fits in perfectly with our culture, our entertainment, our background, and our image of “what happens here, stays here.” And so I’m just a strong believer in that. I know there are some people currently working on that in the city and county, but if nothing happens by January 1st and I am elected to County Commission, that’s my number one goal. I saw some of the proposals that they had for consumption lounges earlier this year. I personally felt that they were a bit rigid in how they were proposing it, such as no mixing of alcohol and cannabis in the same building, or you would have to bring your own cannabis to the lounge and you could not buy it on site. Do you think that these things will loosen up over time? Yeah, I’m big proponent of “the less you dictate, the better.” I think, basically, there should be an ordinance that says if you want to provide consumption, whether it’s an event or a lounge, come to us with your ideas and we’ll have a process to evaluate it and give you a special use permit. I’d have a criteria in which you’d have to come back every few months and we’d take a look at it. Let me also say this about consumption lounges. I know West Hollywood has started to look at the idea and I know that Sacramento just had a big High Times festival where they had marijuana. My plan is, after the election, whether I win or not [in the primary] on Tuesday, is to organize a legislative tour to California and see what’s going on there and if we can learn anything. My perspective, the biggest concern seems to be whether somebody goes into one of these places and then gets back into a car. Perhaps you’d have to show that you came in a limousine, a shuttle van, or an Uber, and didn’t drive up in car. Then I don’t see what the problem is. Do you think a lot of people are more concerned about the city smelling like marijuana and that is why public consumption is outlawed? There are plenty of people out there that are using edibles or vape pens in public which are a little more discreet. Is there an argument for those things to be legalized for public consumption because they don’t have what some would see as an offensive odor? That’s a good point too. I think [the problem with] public consumption is really the idea that somehow there’s an odor that’s in the faces of other people. But the truth is, you do smell it now. People tell me they smell it walking down the strip, because there is no place that you can use it. The police are obviously not arresting anybody for public consumption, so the fact is, if we had a place that you could legitimately use it, we could point people somewhere. Using the same kind of filters that you guys (at Reef Dispensaries) have invested in, it wouldn’t be hard to have a consumption lounge where no odor came out of the building. The one thing about not having lounges, is that it can push people to edibles, which as you know, for a first time experience can be not that good. I think even for that reason we need to have lounges, so we don’t force consumers to overdo it if they start out with edibles. The banking issue still presents huge challenges for the employees of the cannabis industry and limits its growth. What do you see as a solution for this? Well, in California, the state senate just passed a bill that would allow for some kind of banking. The Corey Gardner / Elizabeth Warren bill that is in the U.S. senate has some revision for banking. The reality is, we were all set to have banking and then Sessions went through the Cole Memo and everybody freaked out. There’s lots of banks out there around the country that are doing it, but not so much in Nevada. If I’m elected for the county commission, at least the county can provide safe transportation for your cash. We’ll come pick it up and take it wherever it needs to go. It’s not good for us to have cash out there because it’s tough to keep track of for tax purposes. It’s not good for your industry either, because that just invites crime. There’s just no excuse for it. We have to fix it, so I am committed and will be there fighting tooth and nail. You’ve been very vocal about the opioid crisis and cannabis as an alternative to pain meds. If elected, what would you do to work on this issue? Well, from the county I’m not sure how much we can do on this issue, other than be vocal and obviously lobby the legislature. Of course you can buy it over the counter if you are 21 and use it for anything. But the one issue that I’ve come across recently is that insurance companies are drug testing people on opioids and if they test positive for marijuana, they won’t give them opioid prescriptions. We have to at least pass a state law that says if you are on opioids, whether you use marijuana or not is not an issue. And then we have to maybe even provide that insurance companies have to cover the cost of marijuana to help with opioid withdrawal. Even if that means you use less opioids, that’s more preferable than the current system. The laws are just so backwards that they force people into things that are the worst thing for them. Another topic that we’ve explored together in the past are the vets and the VA and what we are doing for them. Do you see some solutions in that department? Because the VA is federal, we can be very vocal. We can also go back to DC and rile everything up. It’s crazy that here we have a non-addictive alternative for PTSD that everyone universally agrees is good. The VA says the doctors can’t even talk about marijuana or prescribe it and again you can lose whatever you have if you test positive for it. I think a lot of it is just about being very vocal and not giving up. There are a lot of veterans groups that are very organized on this issue, so we need to work with them to go back and lobby congress, and I hate to say it, even lobby Trump. You tweeted that the war on drugs was a racist war on people of color. Can you elaborate on this and what we can do to change it? Well, we’ve done it here in Nevada by legalizing marijuana. What we need to do now is go back and take care of people that have marijuana convictions or arrests on their record, which can follow you the rest of your life. We need to get that blanket expunged. People shouldn’t have to take affirmative action, the government should come in and take that off your record, just wipe all marijuana convictions and arrests. I am also proposing a law that employers can’t drug test for marijuana. There’s no reason to drug test for marijuana. The fact that the school district is testing employees but are begging us for marijuana tax money seems a little hypocritical to me. Even the county, they drug test for marijuana and you can be fired if you test positive. I’m going to stop that, first thing. There are lots of things like that we can do. The reality is, it has been used to keep minority populations down and disenfranchised. Marijuana is the easiest to talk about, but even if you get into the hard drugs, like cocaine or heroin, [addictions to those drugs] those are illnesses. Although they are illegal, it’s clear that you can’t criminalize your way out of using drugs. We’ve done the worst possible thing for our society and we need to just start focusing on treatment. I think we need to tax alcohol and some of these other substances which cause great harm and have those funds available for those people that need rehab. Right now, insurance may cover one or two rehabs, after that, your family has to go into their life savings, which is crazy, when we know a certain number of people are going to be addicted and have problems. Those substances should have to pay for it. That reminds me, have you seen that billboard around Las Vegas that says “JUST BECAUSE IT’S LEGAL, DOESN’T MEAN IT’S SAFE!” with a big marijuana leaf on it? Tick: Listen to this, I’ve been doing some research, and alcohol provides $45 million dollars in state taxes, which is far less than marijuana which has a tenth or a twentieth of sales. Alcohol is the number 1 health issue in the country, not to mention all of the DUI’s and everything like that. We’re not going to eliminate alcohol, but we might as well face the fact that it causes huge social problems. If we can have a 10% excise tax on marijuana, why can’t we have a 10% excise tax on alcohol? You tweeted that your opponent believes marijuana should be illegal. Can you elaborate on this? That’s his campaign and all of his supporters. All they do is attack me for being “Mr. Pothead” and “smoking pot” and blah, blah, blah. They’re very vocal that they think marijuana is a gateway drug, a terrible drug, whatever. I just disagree. I don’t encourage people to use drugs, but if you are going to, marijuana is probably the best one there is. The fact is, it’s something people use. We’ve generated over $120 million dollars in tax revenue statewide, that doesn’t even include local governments and state taxes. No other industry generates anything even close to that, as far as taxes go. It’s been a huge success. Do you think other gaming companies will follow Caesars Entertainment in dropping marijuana screening for employees? I think they’ll have to and I think everyone will have to, because they won’t be able to find a workforce that can pass. If you stick with people that can pass these drug tests [for marijuana] then you are preventing yourself from having the best employees that you can have. Why would you do that, when it’s a legal substance that is being used to pay for schools? It makes absolutely zero sense. I think there’s a big difference between being high at work and using it in your spare time. If someone showed up to work drunk, surely they would be fired, but we shouldn’t fire someone for drinking off the clock, right? The same should apply for cannabis. It’s a legal drug. How can you say, “You can’t go out on the weekend and use a legal drug that is paying for our schools, but by the way, if you show up Monday and test positive for marijuana, we will fire you or not hire you.” That, to me, is hypocrisy at its worst, and the state needs to step up and say that. It’s different if you are a commercial driver or something where it might have an impact, so if you were to say no alcohol and no marijuana, then I could see that, but to single out marijuana..? You mentioned that there were some issues with Nevada marijuana tax money going to schools. Can you explain to me what exactly the issue is and how we can fix it? Sure. There’s a 15% wholesale tax that was in Question 2. That money goes to schools. But the governor also asked for a 10% excise tax in the last 2017 legislative session and that tax was added on the last day of the session, a year ago. But when he asked for the tax, he said he wanted it to go to schools, but when it actually was enacted, at that point, it was too late for the legislature to give it to schools and they sent the money to the rainy day fund, which is basically a savings account. That money was predicted to be about $65 million or so, over the two year period. What’s happened is, that money has come in more significantly than the governor anticipated–about 50% more–and meanwhile, the schools are obviously hurting. My proposal was, the tax was originally proposed for schools, so let’s call a special session of legislature and direct that money to the schools. Unfortunately, the governor said no, so we’ll have to wait until next February when the legislative session meets again. At that time, then that money will be directed towards schools, which is where it was intended for. How about the DUI test for marijuana. How can we better perfect that? Well, last time we made a major improvement by taking it out of urine and isolating the substances that are truly tied to impairment, but the standard is way too low. So hopefully, this session they can raise the standard. Some people–especially medical patients–their standards can be through the roof, but that’s just because they use it all the time. So we need to have a medical presumption – something where it’s not just automatic if you test at this level, then you are presumed to be impaired, because many people at all levels can function perfectly fine. How far off do you think we are from federal legalization for marijuana, realistically? I think we will have something like the Cole Memo in place before November of 2020. I think the Democrats are already on board. I think the Republicans are starting to see this issue. I think it’s also a generational thing. The old, white people are dying off and if they hope to have any chance at winning elections in the future, they need to come to reality. It’s just so simple. Other than Jeff Sessions, I think there’s no one in the world that still believes all that crap.